We have extensive experience in all aspects of commercial and domestic roofing. We also keep abreast of new developments in building technology, which can offer you real benefits in terms of cost, durability and speed of completion. Roof surveys – if you are buying a property, we can conduct an independent survey and provide a written report. This is also a service we regularly fulfil for estate agents. Flat roofs – there are a number of solutions for the repair and replacement of flat roofs, including durable fibreglass systems/GRP, lead and built-up felt. 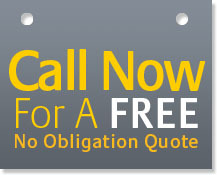 We provide a 10-year guarantee on all flat roofs. Slate – a traditional covering for pitched roofs, we can match your existing materials or provide alternatives (although you may require planning permission in some instances). 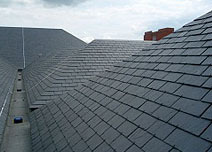 We source a variety of slate at competitive prices, either reclaimed or new, depending on cost and availability. Shingles – we use durable, Canadian cedar, proven to cope with extremes of weather and with an attractive, fine and even grain. Tiles – there is a vast range of roofing tiles available on the market. We can give you advice on which to choose and show you examples. We will also be able to match pre-existing tiles. Stone slate - very common in the Yorkshire Dales, we can supply new or reclaimed traditional stone slate, to preserve and enhance the character of your property. Commonly known as “Yorkshire greys”, they are used a great deal in renovation work. Chimney work – we undertake pointing and rebuilding, and install chimney-cowls and chimney-pots. We can also replace failing leadwork. Sun tunnels – the famous Velux™ company has pioneered the development of sun tunnels, which allow natural light to flood into previously dark areas of your home. They are relatively simple and quick to install. Guttering & fascias – we provide you with a choice of traditional materials (cast iron and wooden) or long-lasting uPVC and aluminium solutions. hips and flat roofs. We are experts in all types of leadwork. Velux windows – the Velux™ brand is synonymous with high quality and durable roof windows. We can supply and fit all sizes.